Reach Remarkable has partnered with Firstbeat to model your physiology. Using a unique multi-day heart rate variablilty monitor and analysis, we can visualise your bodies reactions to daily and environmental factors while you go about your day – whether at work, during leisure, and even while you sleep. The detailed analysis provides a complete picture of your physical health and performance, detailing periods of your day when your body was in stress, recovery and activity. Prolonged stress without the opportunity to recover can lead to overload and exhaustion. The Reach Remarkable Lifestyle Assessment, supported by a one-to-one review can highlight insufficient recovery levels before they become a serious problem. This information can help train our awareness, and support us in building preventative solutions that keep us energised. 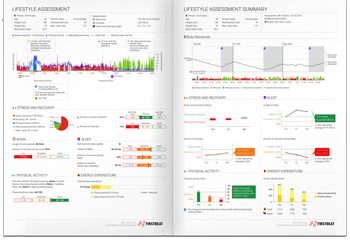 See an example Lifestyle Assessment report. Our Lifestyle Report can be included with our one-to-one services, or added to group training such as 7-Weeks to Performance, Resilience and Wellbeing. For groups, we provide a group report, and individual reports, with optional one-to-one follow-up. Intrigued? Have questions?… do get in touch!